Seek vengeance for the lone survivor of a Dominion massacre. 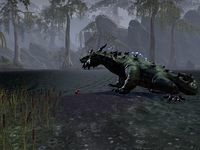 The Dominion slaughtered the Argonians living in a small hamlet in Shadowfen. Only one remains alive to take his vengeance. Kill Maldur and cut out his heart. "While I was hunting, the Dominion killed my family and friends. These warm-bloods must die! They've turned this place into a forsaken hamlet! I can pick off their scouts, but their leader, who deserves death most of all, is too strong for me." "He's the sadist who slaughtered innocents and hatchlings. They call him Maldur. I've seen his filthy banner over their camp. Burn his banner. Defile his camp. He's too proud to ignore an insult. Cut out his heart, if he has one, and bring it to me." You'll find Maldur's banner hanging from a post in the middle of the camp's northwestern clearing. Approach it and interact with it to burn it. Doing so will indeed attract Maldur's attention: he'll rush forward, indignantly crying out, '""How dare you? Death for your insolence!" As you start to damage Maldur, his healer, Aza, will appear, yelling, "You can't kill the commander, filth!" Aza is an excellent healer and can easily keep Maldur alive, but she's less able to defend herself. Killing her will give you the opening you need to kill Maldur. "I heard the alarms from the Dominion camp. Is the butcher dead?" "Ah, yes! This will help my egg-brothers and egg-sisters rest in peace!" "Beautiful, wasn't it? Maldur wanted to consume the power of the Hist, but instead he was consumed." I suppose it was a fitting end. "I have a reward for you. It isn't much, but I stole this from their camp. It's yours. Now to make the rest of these invaders suffer." Prowls-in-Stealth thinks burning Maldur's banner is the best way to get his attention. I agreed to do it. If I fight him one-on-one, his heart will be in my hands in no time. I have Maldur's heart, as Prowls-in-Stealth requested. I need to find him at the swamp's edge below the Dominion's southeastern camp. Finishes quest With the Dominion's leader dead, perhaps Prowls-in-Stealth can find some peace. This page was last modified on 4 August 2018, at 18:38.